Simcha Goldin say he feels 'no joy' at news his son's killer was killed in Gaza strike, but is satisfied that the IDF got the job done. 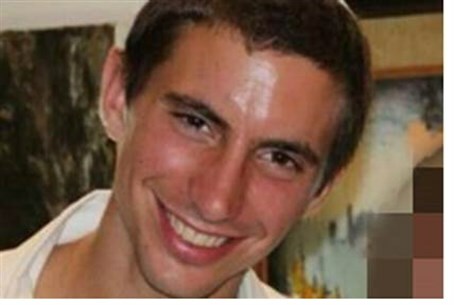 Simcha Goldin, father of fallen soldier Second Lieutenant Hadar Goldin, has responded to news that one of the senior Hamas terrorists eliminated in an early-morning airstrike in Gaza was responsible for the attack which killed his son. Raed al-Attar was killed along with Mohammed Abu Shamalah and Mohammed Barhum in the pre-dawn IAF strike, representing a serious blow to Hamas's military command in southern Gaza. Goldin was declared dead two days later, but Hamas are still holding his body, along with that of another soldier, Oren Shaul, as bargaining chips. Simcha said while the death of the man responsible for his son's death brought him no comfort, he had always had confidence that the IDF "would get the job done." "I am not happy following this - I'm still in mourning," he told Channel Two. "But I knew that the IDF would do the job and that's great. (But) there is no joy or hate or anything like that." Noam Shalit, father of Gilad Shalit, also issued a response to the airstrike. Both Abu Shamalah and Attar were involved in the kidnapping of his son in 2008. Attar in particular is said to have been the mastermind of the attack, which left two other soldiers dead. "I heard about it this morning in the news like everyone else, and I still haven't spoken with Gilad - I don't know if he knows," he stated. Shalit refused to relate to the details of the elimination or to Attar specifically, but expressed hope that the ongoing military operation would finally bring quiet to southern Israel. "What I am able to say is only that we hope quiet will return to the southern communities because they deserve quiet - and also that all the soldiers of the IDF will return in peace to their homes."